Hello! Welcome to the Taylored Expressions May Release Day! We are releasing 5 new stamp sets, 6 new dies and a 2 new cutting plates. They are all available in the store now! Both of my cards are clean and simple. On the one above, I used the negative die cut on the larger flourish. Behind it, I added strips of Silver Motif Trendy Tape to another piece of cards stock and layered the two together. The sentiment is from Happily Ever After. I finished it off by adding a grosgrain bow. My next card uses the other flourish on the bottom. I used pieces from the Band It Die (bottom piece covered with same Trendy Tape before die cutting), then I added the flourish and another piece from the die for my sentiment. The image (cropped from its full size and framed in the larger Instant Photo Frame) and sentiment are from Lifetime of Love. I also added a portion of the larger flourish to the right of my image panel. 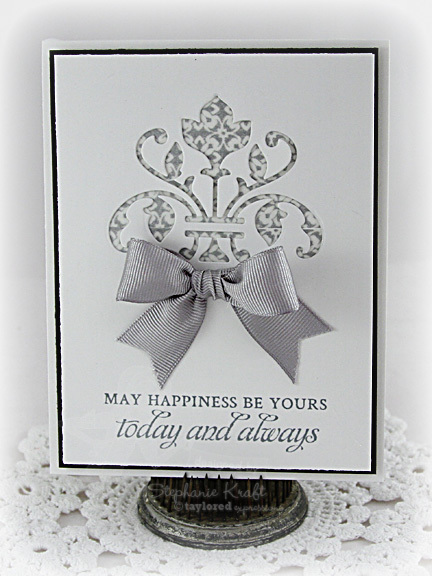 Accessories: Taylored Dies: Damask Flourishes (Taylored Expressions), Trendy Tape – Silver Motif (Queen & Co), Ribbon, Foam tape. Accessories: Taylored Dies: Damask Flourishes, Band It Die, Instant Photo Frames (Taylored Expressions), Markers (Copic), Trendy Tape – Silver Motif (Queen & Co), Foam tape. These are gorgeous Stephanie! I love the peek a boo layout of the first card - it's so elegant. And the second card is just so fun! LOVE these! Gorgeous, Stephanie! I LOVE how you used the die negative on the first. . .what an awesome effect! The second card is just adorable! So creative. I love the cool elegance of the first card and the fun image on the second! Beautiful cards Stephanie! Love the simple elegance of the first and the sweet colored image on the second! WOW!!! 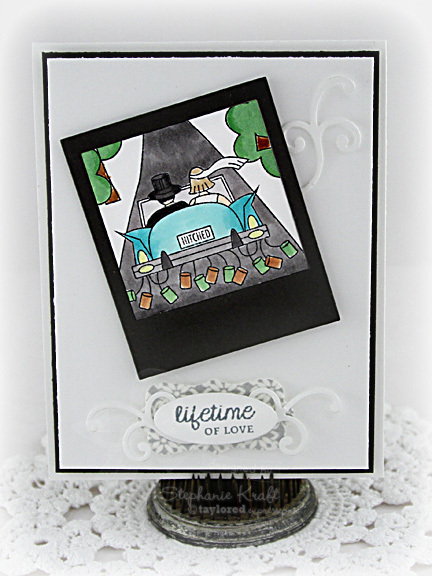 Your first card is sooo elegant and classy and what pretty coloring on the second...you do such beautiful work, Stephanie!! !